Australian screenwriter Stuart Beattie is responsible for such cinematic delicacies as 2003’s The Curse of the Black Pearl not the best of the Pirates of the Caribbean franchise, Collateral (2004) and GI Joe: The Rise of Cobra (2009) described as “an over-the-top action fest propelled by silly writing” For his second attempt at directing a feature film he has turned to a graphic novel by Kevin Grevioux, who also has a part in the movie. Beattie’s fantasy action film is just another way of portraying ‘good verses evil’ this time in the guise of Gargoyles (good) and demons (evil). As you have probable gathered from the title the story centres on the Frankenstein legend, first found in Mary Shelley’s novel of the same name published in 1818 and plagiarised ever since, but rarely bettered. 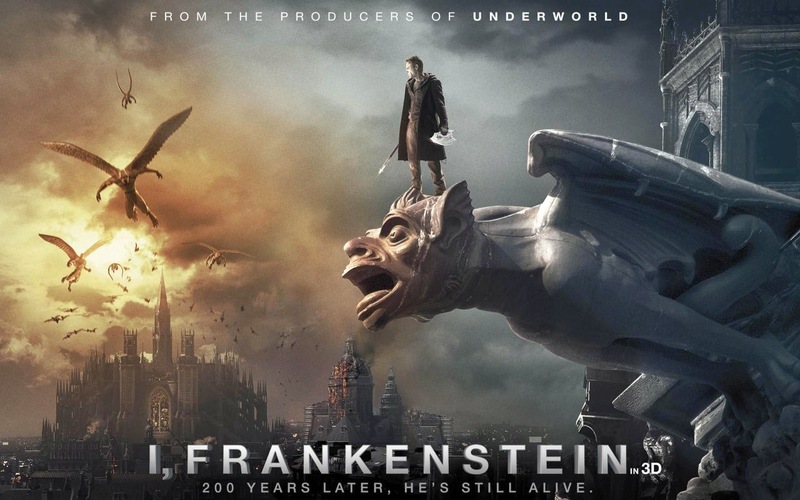 This latest incarnation, I Frankenstein (2013), stars Aaron Eckhart as the monster, Bill Nighy as Prince Naberius the prime villain and leader of the Demons, Yvonne Stahovski a scientist and the films saccharin love interest along side Miranda Otto as queen of the gargoyles. Good effects can’t disguise a flimsy narrative that finds the monster involved in the ancient battle between Gargoyle’s and Demons. Eckhart tries his best but the rest of the cast aren’t quite up to the task. Unless you’re a glutton for punishment give it a miss.